Good for those who are trying their first skin peel or even regular users who want a minimal peel with little downtime but still want to turnover the skin cells for a fresher, younger look. Light Peels at Level 1 are the stepping stone for anyone wishing to become proficient with using chemical peels. Using a chemical peel can help you to reveal newer younger looking skin. The process of the skin peeling removes the uppermost layer of skin on your body - this layer is often comprised largely of dead skin cells. Removes the uppermost layer of skin on your body - this layer is often comprised largely of dead skin cells. 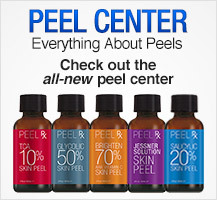 Performing a peel and turning over your skin will actually help to cause your skin cells to go into production. Turning over your skin will actually help to cause your skin cells to go into production. When your skin gets active it can create more collagen and elastin - so the stimulation from a chemical peel can increase many of the key skin cell elements that make up a youthful looking complexion.